(Sternula antillarum, formerly Sterna antillarum) In early spring, least terns return to Florida from wintering grounds in Latin America. They soon pair up using courtship rituals in which hopeful males offer small fish to prospective mates. The seabirds nest in shallow “scrapes” they make on broad expanses of bare sand. Peak nesting season is from mid-May through July in central Florida, though nesting may continue through August. Eggs are incubated by adults for about 21 days. The young leave the nest in a few days, but don't begin to fly until about three weeks later. 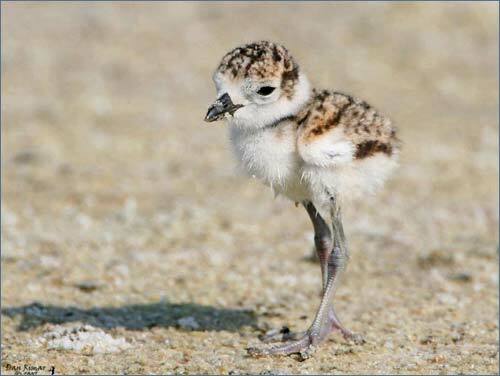 For a brochure on beach-nesting birds or to report a colony, contact Florida Fish and Wildlife’s northeast regional office at (352) 732-1225. 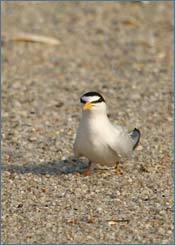 Nesting least terns are extremely susceptible to disturbance. Eggs and young birds blend in perfectly with the surrounding sand. This camouflage coloration is a good defense against many natural predators such as crows and laughing gulls. Unfortunately, this strategy backfires when beach-goers unknowingly walk or drive through nesting areas destroying eggs and killing young birds. Even if colonies are not directly impacted, disturbance near nesting areas can cause adult terns to leave their nests and young to chase away the source of disturbance. If this happens to often, eggs and chicks can overheat and perish in the hot mid-day sun. Because of these problems, least tern colonies are often posted to keep vehicle and pedestrian traffic away from nesting areas. Least terns are “colonial” nesters, meaning they nest together in groups. Colonies can range in size from just a handful of birds to hundreds of nests. Colonial nesting provides safety in numbers from aerial predators and is also thought to aid exchange of information about constantly shifting food resources (mainly schools of small fish such as sardines and menhaden). Adult and juvenile least terns are thought to follow successful foragers back to areas where they are catching fish. In the past couple of decades, due to habitat loss and disturbance on natural beach nesting areas, least terns have taken to nesting on flat, gravel roofs. It is thought that perhaps 70% of least tern colonies are now on rooftops in Florida. However, these nesting substrates are disappearing fast as these older buildings are demolished or reconstructed with more modern roofs unsuitable for tern nesting. This makes natural mainland beach and barrier island habitats all that more important to least terns. Along the entire Atlantic Coast of Florida this year, less than 10 least tern ground colonies have been reported. The most important thing any beach-goer can do is to respect posted areas and report nesting birds in areas where colonies have not yet been posted. Dogs should be left at home or kept on leashes well away from posted areas. Least tern colonies on rooftops often don’t last long as building owners see the birds as a nuisance to patrons visiting their establishment. Encouraging building owners to accommodate nesting terns rather than get rid of them, may help these areas continue to be important breeding sites for least terns for years to come. Report bird harassment to the Florida Fish and Wildlife Conservation Commission Wildlife Alert 1 (888) 404-3922.